CASTELIJNS H & DE MAAT B (2018) Numbers and diet of Rock Pipits in the Verdronken Land van Saeftinghe, the Netherlands. 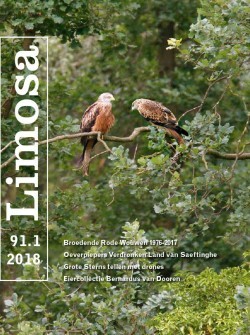 LIMOSA 91 (1): 16-29. We studied numbers and diet of overwintering Rock Pipits in Saeftinghe, a wetland in the Southwest of the Netherlands. Earlier estimations of numbers of overwintering Rock Pipits in Saeftinghe as well as in the Lower Saxon part of the Wadden Sea were based on sample surveys, but these estimates were shown to severely underestimate Rock Pipit numbers when compared with transect counts. The highest number of Rock pipits in Saeftinghe, 5300-6200 birds, was present in November. Rock Pipit numbers in Saeftinghe have been stable for over 20 years. The diet analysis of overwintering Rock Pipits in Saeftinghe was based on investigating prey parts in faeces. Potential prey items were sampled in the pipit's main feeding habitat, silt creeks, by collecting soil samples. This provided a reference collection for the determination of prey remains in the faeces, but also information on prey availability. Prey parts in Rock Pipit faeces mainly consisted of small crustaceans Crustacea, small salt-tolerant snails Assiminea/ Ellobiidae, insects and polychaete worms Hediste. Combined with the data gathered on prey in the soil samples, it is likely that the birds foraged on Mud Shrimps Corophium volutator, Dun Sentinels Assiminea grayana and Ragworm Hediste diversicolor. Although not detected in the soil samples, insects were also eaten and were probably caught by the birds in the salt marsh vegetation. Parts of some organisms were detected in the faeces but were not found in the soil samples. However, quantities were small, which suggested their contribution to the diet was probably minor. A reservation has to be made for Oligochaetes Oligochaeta spp as these were very common in the soil samples, but cannot be recognized in faeces as all their parts are digested. In conclusion, it is likely that the number of Rock Pipits is seriously underestimated during regular bird surveys. Assuming the most recent estimation of Rock Pipit numbers in the Netherlands, Saeftinghe would be the main overwintering area for the Rock Pipit, with 42-84% of the birds staying here. We think this is an overestimation and we believe it is important to conduct transect counts in other areas as well to get a better estimation of the number of Rock Pipits wintering in The Netherlands. Even so, Rock Pipits are apparently able to find sufficient and the right type of prey to stay in Saeftinghe in high numbers during the winter months.